1. My wife and kids. Simply everything about them. 2. Completion of writing and publishing of my first book. 3. The book is selling well. 4. Having a GREAT job come my way in December (which will make for a great 2006). 5. Meeting some very cool people and establishing new, mutually beneficial friendships (many of whom I met because of my book and my blog). 6. CRHP 25 at St. John Neumann. 7. The trip to Italy and France. 8. Annual Family Reunion with my dad and brothers (and their families). 10. Losing 30 pounds, and keeping it off (well, mostly). I want to wish everyone a wonderful 2006. This is your last chance to vote for the best "Guest Blogger" of the year on the Some Assembly Required Blog. We need your vote today (Voting ends at midnight on December 31, 2005). The winner gets a $50 Gift Certificate to QuickGifts.com. Click on the names below to read their great posts. Ahhhhh, the Holiday Season is drawing to a close. OH SHOOT....It is time for Thank You Notes. Your mother was right, you must properly thank people for the gifts you received during the holiday season (or anytime throughout the year). Were you invited to a great corporate holiday party? Send a note thanking the person/people who invited you. Got a great gift basket, popcorn tin, cookie bouquet or other present of good cheer (an ipod with a vendor's logo on it?)? Send a short note to acknowledge your appreciation. Did someone give you a big piece of business or refer you for a new job in 2005? Send an expression of "Thanks". A short investment of time to pen a handwritten thank you note is worth more than its weight in gold. So few people send thank you notes in our busy society that you will stand out from the crowd if you show others that they are worthy of this gesture of gratitude. If you cannot immediately think of ten people who deserve your thanks, then you are not really networked in the first place (and therefore not reading this blog anyway). Go on, just do it. Send your Thank You Notes today!!! The day after Christmas I decided to brave the local shopping mall. My wife and I had gone to lunch, and I mentioned that I needed some new clothes for work (I start my new job this week), and I thought that the Nordstrom's Men's Sale might have some good deals. She dropped me off at the mall, so that I would not have to hunt for parking, and launched me into "shopping hell", promising to return three hours later. I had never been to the mall the day after Christmas, and had no idea what a nightmare this can become. I decided to grab a cup of coffee to perk me up before my sale rack adventure, but the line at the coffee bar was about twenty people deep. My patience was already short, and if I had a car, I would have left immediately (I suspect my wife knows me too well and this is why she abandoned me with no transportation). Since I could not flee the place, I ventured into battle. First of all, I immediately learned that if you are a somewhat average size, you cannot show up at a big sale at 2:00 PM. To find deals, you must be there when the doors open. If I was short and fat, there were lots of great pants to choose from, but the 34/34's were nowhere to be found. In addition, the great dress shirts that Nordstrom had on sale did not exist in my size. After about 45 minutes, I ended up with five new shirts, but only two were on sale. So much for my plan to take advantage of the sale. However, during my shopping spree I did run into five people I knew from the local business community. I was able to have some quick conversations, catch up and alert these folks to my new job which I will start in the new year. I even set up lunch with one important person, whom I had lost touch with. You never know when you can do a little business networking. I then decided to venture out into the open waters of the mall. Again I glanced at the coffee bar.....more in need of caffeine than I had been an hour earlier, and yes, the line was longer. The mall was crazy. There were more people than at a rock concert, and it did not take a genius to realize that by December 26th people's Christmas Spirit was already running on empty. I was able to buy some pants and a nice blazer, but the next two hours were peppered with running into more friends and business contacts, who also had decided to brave the After-Christmas sale day. And everyone was glad to see a friendly face. Even some people I hardly knew were stopping me to chat. I think the chance to take a fast break from the madness of the shopping experience to talk with an acquaintance made their day, too. Always remember, you can network anywhere and everywhere. While browsing through the blogs I read regularly, (BW Price's Marketing U Blog) I ran across a link to a great article about networking from Business Week OnLine. The article, "Networking for the Right Reasons", by Carmine Gallo, is a quick read and has some great pointers. I have never understood people who are critics of networking. (How can anyone criticize reaching out to clients and prospects and showing them you think highly of them?). While networking alone is not the answer to all of your business needs, to ignore the importance of building strong business relationships is a HUGE mistake. People do business with people they know and like. Don't kid yourself into thinking that you can be a jerk and win in business. Sure, there are lots of examples of legendary tyrants who succeed, but do you really want to be that kind of person? But sitting around (or claiming that you are "too busy") is not how to create a network. It takes a commitment of time and effort. You must reach out to other people, get to know them and assist them with what is important in their life. Building relationships means putting other people first. If you agree that being "networked" would help your career, then get to it. Do something now to start the process. If you disagree, please leave a comment on this post explaining why you are better off not having strong business relationships. I'd love to hear your side of the story. I vividly remember Christmas Eve 1971. I was five years old. After dinner my mom tucked me into bed. Getting to sleep early was very important, as Santa Claus, the big guy, would come that night. To not be asleep could risk his passing your house in his sleigh. That would mean no toys....and at five years old, it is all about the toys. As she tucked me in I heard the bells outside in the distance. The jingling got louder, and through the drapes I could see the distinctive glow of Rudolph's red nose. Swwwiiishhhhhhhhhhh, the red light passed at high speed right past my window while the jingle bells chimed. "Hurry", my mother advised. "Santa is checking to see if the good boys and girls are asleep". OH MY GOD!!! I pulled my head under the covers and tried to fall asleep as quickly as I could. I had seen the light from Rudolph's nose. HOW COOL IS THAT. Years later I realized that my older brothers, all teenagers at this time, were working the bells and with a flashlight and some red plastic,.... running past my room. Ahhhhhh, but the magic of Christmas was alive and well that night. In this holiday season, people from all beliefs can come together in the spirit of brotherhood, goodwill, and renewal. Regardless of your religious beliefs, I wish you much joy and success in 2006. Thank you for being a reader of my blog!!! Read My Book, Please !!! a "must read" for the new year. We NEED Your Vote !!!! The "Best Guest Blogger of 2005 Contest" is nearing the end. With just one more week to of voting, it is a close race. Please review the "Guest Blogger Friday" posts and vote (by leaving a comment or sending me an email) for your favorite article. Those who have taken the time to read all the guest blogger posts have commented on what a fountain of useful information and tips our wonderful guest bloggers have provided. Come on.....you know you want to re-read these posts and help propel your favorite victory and the $50 Gift Certificate from www.quickgifts.com. Click on each name below to read their post. Rudolph was just an average raindeer. Sure, he had that red nose, which was very shiny. If you had seen it, yes.... you would have said it glowed, but it was really just annoying and caused him all kinds of problems. All of the other reindeer simply did not appreciate Ruldolph. They even went so far as to constantly make fun of him and excluded him from reindeer networking events. Even his own father, Donner, was not fully supportive of him and privately confided to his best friend, Blitzen, that he was unsure if Rudolph would amount to anything in the reindeer business. However, Rudolph hung in there. He believed in himself and his unique abilities, even when others did not. He continued to do his job and fine tuned his flying skills. Then one rather foggy Christmas Eve there was a problem. The fog was so thick that the boss, Santa Claus, was not sure how they were going to honor their delivery guarantees to their clients around the world. That was when they discovered that Rudolph was not so average after all. His red nose had the technology to shine through fog and light the way. His flying skills were superb, and he got a field promotion to lead reindeer, which included a raise of more straw and hay. Because of his tenacious attitude and the gracious manner in which he treated his fellow co-workers (he never rubbed it in that he got the top job), they were not jealous of his assent into management, but rather, very supportive of Rudolph. One might even say that they loved him and shouted out with glee, as his contributions to the company made everyone more successful in their jobs. The whole reindeer opperation flourished thanks to Rudolph's not quitting when faced with adversity. In the long run, he prevailed because of his "stick-to-it"philosophy. Rudolph The Red Nosed Reindeer, He'll Go Down In History!!! Lists are not just for Santa. As you plan you business development for 2006, you should make a list and identify your top prospects. If you do not know who you want to do business with, you may not recognize them. Nothing is worse than letting an opportunity slide past because you were not prepared. I suggest that you first identify your fifty top current clients. Make note of their industry, how you originally landed the account, and reasons why they stay with you (rather than switching to the competition). Now look for trends. Once you understand who your clients are and why they do business with you, it is easier to start looking at who should be your prospects. If you identify your prospects in advance, it will make your cold-calling, networking and business development/sales activities much more easy to prioritize. Only Six More Networking Days in 2005. Don't Waste Them!!! your brand and your goals. I have heard from many people who want to do more in the new year to grow their business network and build their "brand" and reputation. This is a great goal. Since everyone agrees that "people do business with those they know, like and trust", making sure that people know about you and your company is the first step to more business. I recently heard from a man who is very interested in networking. He began his comments to me that he really understands the importance of a network, and he knows that he has to do for others before they will do for him (many people miss this point). However, he added that he hates networking events, and sees most of the people he meets as "professional time-wasters". He wants to find a way to dive right in, make deep connections and still get home every night to his wife and kids. While we would all prefer that we only interact with others who are "ideal" people to add to our network and that we quickly build that rapport and trust, it just does not work that way. To make real connections in the business community you need to invest a lot of time, and this will involve some events that do happen during the dinner hour. Sorry, it is just the way it works. Additionally, you will have to meet a lot of people who you may be able to establish a relationship. Not everyone is "ideal" for your business, but you should not write those people off because you never know who they might know. While their business might not be a match for what you do, they just might be friends with someone else who would be a perfect connection. To properly build and cultivate relationships in the business community you must focus on networking and make it a priority. Look around, those who are "Well Networked" did not luck into those friendships. They worked over time to create them. I recently was offered a new job with a fantastic company. I am very excited about the opportunity and look forward to starting in January. A local business person told me yesterday "wow, you are so 'lucky' that they called you". Fortunate, YES. Lucky....NO. I was fortunate that my networking in the local business community over the past few years had allowed me to meet my new co-workers and develop a relationship. I was fortunate that they thought of me when the "Business Development" position opened up. It was NOT luck. Best of luck to you in growing your business network in 2006. 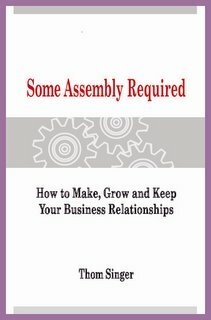 I hope you will consider reading my new book, "Some Assembly Required: How to Make, Grow and Keep Your Business Relationships" (New Year Publishing, 2005). It was a lot of fun to create this book, and it is filled with many useful tips and thought provoking ideas on how to build your own brand through your networking activities. More information is available at www.thomsinger.com. During these last two weeks of the year, do not allow yourself to fall into the "Holiday apathy" trap. It is easy to just coast at work for the last part of the year, as there are many distractions, and your boss and co-workers might be away visiting family. Instead of making excuses, look at the next two weeks as a time to double you efforts and set the momentum for 2006. Even if people are on vacation, leave a voicemail wishing them a "Merry Christmas"(no, it is not THAT politically incorrect to say that....or say "Happy Holidays") and letting them know you will call them in January. If you have not yet sent your Christmas Cards (yes, there are a lot of people who still have not done that), then scrap that idea and make plans to send "New Year" cards. If you have not mailed your cards, the odds are slim they will arrive on time, and at this point the underlying message is "I could not get my act together so I am just rushing and sending these late". Use that time for more productive activities. (yes, this could mean throwing away or saving for next year the cards you already paid for...but that is better than broadcasting to your clients, prospects and friends that you are just not organized). Come on, get excited for the last two weeks of the year and don't be a Holiday Slacker. Guest Blogger Friday Contest - PLEASE VOTE!!! In August this year I began "Guest Blogger Friday". This has been a great addition to the "Some Assembly Required Blog", and we have all been treated to some fantastic posts on topics relating to business development, networking, sales, public relations, marketing and other business themes. In an effort to say "Thank You" to all the guest bloggers, and to re-introduce new readers to their great posts, I am going to hold a contest. Please review the below "Guest Blogs" and vote for your favorite post. You can vote in the comment area of this post, or send me an email at thom@thomsinger.com. To vote you must fill in your name (no anonymous comments), and you can only vote once (honor system!!!). Voting will take place from now until January 1, 2006, and I will link to this post every Friday remaining in December (reminding everyone to vote) rather than having a guest blogger. The winner will be announced the first Friday of the new year. "Guest Blogger Friday" will resume the second Friday in January 2006. I will need lots on new "Guest Bloggers" from the readers of this blog, so start thinking about what you will contribute in 2006!!! The winning "Guest Blogger" will receive a $50 gift card from Quick Gifts (http://www.quickgifts.com/), where they can select a top retailer to redeem their prize. This is a non-scientific poll, and I reserve the right not count any suspicious votes, all rights reserved, final decision is mine to make, blah, blah blah. Just setting goals is part of the equation, you need to take action to make them reality. Click on the arrow or double click the "MP3 File" link to listen. Need a quick gift for a business associate, employee, boss or anyone else on your Christmas List? Give them a copy of "Some Assembly Required: How to Make, Grow and Keep Your Business Relationships". This book is a great gift for anyone who could benefit from better business networking skills. This week we have talked about the importance of clarifying your goals and writing them down. Today I would like to focus on the three types of goals. Business Goals: Since most of us spend over half of our days at work, achieving success in our careers is very important. Everyone has different ways of judging what success at work looks like, so their is no right or wrong answers to what types of business goals you should create. Maybe you want to find a new job, get a promotion, make more money, attain more responsibility, etc... The important thing is that you know what you want. By having goals in the workplace it will help you to be more productive and waste less time, as you will be focused on why you are there in the first place. Personal Goals: All work and no play makes Jack a dull boy. No matter how important your job is, everyone has a personal life. Do not fall into the trap where you only look at goals as something you have for work. These goals may be some thing you create alone or with your spouse, kids, friends, etc.... Paying off credit cards, taking that trip to Europe, buying a new home, losing weight, attending all of your daughter's soccer games, etc... are all personal goals. Anything that you know you want to accomplish (or should accomplish) during the year, but that you know from experience get forgotten when all the other pressures of life pile up. Soul Goals: These can often be the most important goals, as if you pay attention to your soul, it makes the rest of the things seem less daunting. I am not just talking about religion, but if you are a person of faith, that is part of it. Additionally I am talking about finding those activities that help you recourse your batteries. Golf, reading, running, meditation, talking a walk in the mountains, prayer, etc... are all examples of things that people do to get away from their daily routines. Find one or more activities that you enjoy that allow you to take some personal time and energize your soul. Even when you are busy with your business and personal life, take some time for yourself. As I mentioned yesterday, you should have three to five goals in each category. Having just one goal would be too narrow of a focus, and having more than fifteen in one year would be too many. Since all of your goals will be attainable, but not easy, you may or may not achieve them all during the year. That is okay. If you are trying to lose thirty pounds and you only use twenty-five, just because you did not meet the final goal, you are still better off because of the progress you made along the way. Do not obsess about checking the goal off the list, thrive in the process. Yesterday we talked about the importance of knowing what you want to accomplish and writing your goals down on paper. Like a flight plan, your written goals are like a map that you should refer to regularly to keep yourself focused on where you are going. But what should you write down? What does a goal look like? And how many goals should I chase at one time? I suggest that you select five professional goals, five personal goals and five "Soul Goals" (we will discuss these three types of goals tomorrow). These goals should be things that will require your focus and effort to achieve, and something that you really desire. Do not write down things that are too easy to accomplish or things that are impossible to achieve. A real goal needs to make you stretch yourself, but at the same time you should not be chasing windmills. Be specific in what the goal is and WHAT SUCCESS LOOKS LIKE. Many people set random goals that have no end. ("Make more money in 2006" is not specific nor does it allow you to know when you have had success) . Think about the "Who, What, When, Where, Why and How Rule" and apply them in creating your goals. Who will be involved in helping me achieve this goal? What will I need to do to reach this goal? Where will the success be? How will achieving this goal effect my life? Having this clarity on your goals will make them more than just something you wish or hope for, but instead you will feel the desire in your heart. This week's posts are dedicated to the importance of setting goals and working toward achieving them in the new year. I am not sure who said it (A goal not written down is a wish), but is sums up the whole argument about setting goals. Most people want to achieve more in their personal and professional lives, and spend a lot of time day-dreaming, but few people take the time to actually set realistic and achievable goals. Fewer still write them down and refer to them regularly. Basically they just "wish" things would get better. In 1953, researchers surveyed Yale's graduating seniors to determine how many of them had specific, written goals for their future. The answer: 3%. Twenty years later, researchers polled the surviving members of the Class of 1953 and found that the 3% with goals had accumulated more personal financial wealth than the other 97% of the class combined! No matter how you slice it, setting goals is a powerful tool. Imagine you were boarding a 747 for a flight from Los Angeles to Honolulu. Your pilot should have a fight plan that shows him how where he will be going. If the strong winds blow the plane of course, the pilot can make minor corrections along the way and guide you to a safe landing at your destination. If the pilot decides to take off and fly west hoping to find Honolulu you are in big trouble. There is an awful lot of blue on the map west of California. Finding the right place to land would be difficult without a plan. Just like a flight plan, your goals help you set the course for where you are going in your life. When you get off course or encounter unexpected obstacles, knowing where you are going makes it easier for you to make decisions. With the new year approaching, many people take advantage of this time to create "Resolutions". While I believe you should be creating, reviewing and revamping your goals all year long, this part of the year is an ideal time to begin.Take stock of where you are right now in your life (both personally and professionally). Review 2005's (both the successes and the failures). And finally, think about what you would like to accomplish over the next 12 months. My wife, Sara (co-author of the "Mad At Martha Cookbook"), and I participated in a "Husband and Wife Book Signing" yesterday at one of Austin's top retail stores. The holiday shopping crowds were out in force at Breed & Company in Westlake. We sold a lot of books and had great conversations with dozens of people. Sara's homemade fudge (which I claim to be the best fudge in the world, and yes, the recipe is in her book) was a big hit. Sara's cookbook out-sold my business networking book, but that was because of the fudge samples and the store's focus on kitchen gadgets and other home related items. But no complaints from me.... as it was a great time. We would like to say "THANK YOU" to Darla and the whole staff at Breed & Company, as they were simply delightful to work with. More info on our books at by clicking on the title below. Both books make a great holiday gift for anyone on your shopping list. The winning "Guest Blogger" will receive a $50 gift card from Quick Gifts (www.quickgifts.com), where they can select a top retailer to redeem their prize. This is a non-scientific poll, and I reserve the right not count any suspicious votes, all rights reserved, final decision is mine to make, blah, blah blah. This week's posts are dedicated to the importance of reading. This week I have focused my posts on the importance of reading and learning. I have received so much positive feedback in comments and emails, as well as some great book recommendations. Thank you to everyone for the wonderful response to this topic. But I realize that not everyone will read twenty-five books next year, or even ten (although you should). However I am going to list the five most influential business books I have ever read on today's post. If you have not read these books, I suggest that you add them to your Christmas gift list and make them priority reading in the new year. You wont be sorry. And I would not be a good salesman if I did not add a sixth "BONUS" suggestion. I hope you will consider reading my book, "Some Assembly Required: How to Make, Grow and Keep Your Business Relationships" (New Year Publishing, 2005), which is available at www.thomsinger.com for $19.95. Writing this book was a great experience, but having people read (and enjoy) it is the best part. 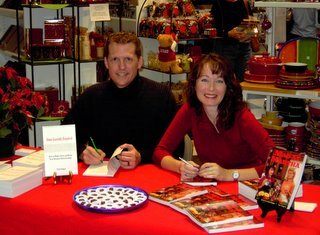 This Saturday (December 10th) my wife, Sara, and I will be having a "Husband and Wife Book Signing" from 1:30 to 3:30 PM at Breed & Company in Westlake (3662 Bee Cave Road). I will be signing copies of "Some Assembly Required: How to Make, Grow and Keep Your Business Relationships" (New Year Publishing, 2005) and Sara will be signing her successful cookbook "Mad At Martha" (Whisk Publishing, 2002). If you live in Austin, stop by Breed & Company and say hello. This weeks posts are dedicated to the importance of reading and learning to help advance your career. Magazines: There are countless magazines that you can read regularly. Most are monthly (some, like Time, are weekly) and cover a specific topic. I suggest you select a business magazine, a trade journal, a news-weekly and an entertainment/pop culture magazine to subscribe to and read regularly. I read Business 2.o, Professional Selling, Time and Esquire on a regular basis. In addition I also read Fast Company, Professional Speaker and The Beta Theta Pi Magazine (my college fraternity's quarterly publication) on occasion. This is a lot of periodicals to cover, and if you do not read regularly, it is easy to acquire a big stack of un-read magazines. My wife helps out by tagging articles in these publications that she knows would be of the most interest to me. Newspapers: You must read your local daily paper everyday, even if you think it stinks!! Many people boycott their local paper because of the editorial political slant (some think their local paper is either too liberal or too conservative). But if you do not read your local paper, you are not able to keep up with the events that are happening in your own back yard. Read every section. If you are not a sports fan, you at least need to have enough knowledge to know what teams will be playing in the Rose Bowl on January 4th (did you even know that the Rose Bowl will not be on New Years Day this year???). Yes, the USC Trojans had better watch out because the Texas Longhorns want that National Championship!!! In addition to your local paper, The Wall Street Journal and your local Business Journal are important papers for business people to read every day. Websites and Blogs: There is so much information on the internet that it can be overwhelming. You could never be able to read everything. However, you should regularly check a couple of sources. Find a news-sight (Fox, CNN, MSNBC, etc...) that posts updated headlines throughout the day. This will help keep you be aware of what is happening in the world. In addition, I recommend you find three or four blogs on topics that interest you and read them regularly (This blog is a great choice!!!). If marketing topics interest you, take a look at the blogroll list on the left of this page and you will discover some great blogs. Newsletters: You probably subscribe to one or more email newsletters . Often times people just delete these without reading them, but I find that reviewing them often reveals some great information. Do not subscribe to too many newsletters, as they seem to come too often (like magazines) and you will always feel behind on your reading. I know this sounds like a lot, and it is. But information is a powerful tool. To not read is to fall behind. Just remember that your competition is always looking for ways to out-shine you. You must stay ahead of the pack. This week's posts are dedicated to the importance of reading. Continuously learning new information is a great way to advance your business career. I thought I would take a moment and let you know what book I am reading this week. It is my 23rd book this year, and although I am only on page 47, I am quite enthralled with this one. Freakonomics, by Steven Levitt and Stephen Dubner is at twist on how to look at all things in the world. Levitt is a rogue economist who explores the hidden sides of everything. Topics from crime, public schools, sumo wrestling, abortion, real estate agents and bagel sales have all been covered so far, and I have not yet reached page 50. I can already tell that this book will challenge me to think. That is what I enjoy about reading books, it forces me to look at the world through a different window. For this I am grateful to my friend, Dave Horn. Dave gave me the gift of books. He was always reading something, and we would discuss the books for hours over strong coffee or cheap beer. While his passion was fiction, his encouragement to read novels lead me to a thirst for knowledge that I did not have while I was younger. I owe much of who I am now to my love of reading. What are you currently reading and why is it something you would (or would not) recommend? Please post a comment with your opinions of the most influential books. This week's posts will be dedicated to the importance of making a habit of reading and learning. I once worked with a man in his early fifties who was SHOCKED when he found out that I have read 20 - 25 books a year since I was twenty-five years old (I will turn forty in 2006). I told him that although I had not been a particularly attentive student in high school or college, I later discovered the importance of learning. He claimed that it would be impossible for me to read that much, since I had a successful career and was obviously very active with my family. I told him that I wake up early every morning to fit in 30 minutes of reading, and on the weekends I find a hour where I can curl up and get lost in a book. I read mostly business, marketing and sales books, but about one in four books is a novel, biography or spiritual topic. His response: "I have not read 20 - 25 books in my lifetime". I was not surprised. While he was very good at his job, he did not usually express that he had a well rounded view of the business world. So why do I recommend everyone devote daily time to reading books? The more you read, the wider the variety of ideas encounter. Nobody is smart enough to know how to react in every situation we encounter in our business and personal lives. Since people tend to learn from experiences, it makes it much easier to learn from others. I also find that if you read the "best-sellers" that it gives you a lot to talk about in your networking situations. People often discuss the themes from books they read. If you have not read the book, you have nothing to add to the conversation. Additionally, if you know what topics others are interested in, referring a book (or buying them a copy) is a great gift to give another person. Never claim you do not have the time to read. If you travel for business, airplane trips are an ideal time to read a book. Wake up early. Lunch hour. And lets not forget your commute (those who take the train, don't just sit there, read), book on tape are a good substitute for reading. (I know, the morning drive DJ's on the radio are funny....but make the time productive!!!). Set a goal for 2006 on the number of books you will read. Start small. Ten is a good target (my book could be one, it is only 100 pages!!!). If you were to read ten books a year that would be fifty books in five years. If you have read fifty books, and the competition has read zero, who do you think will be the most competitive in business? Or, you can be the guy who does not read and learn. Your choice. It is another "Guest Blogger Friday" and today we have a great post contributed by Adam DuVander. Adam is a programmer for various Web sites, but he tells his family that he does "web stuff." He writes how-to technology articles from the front lines Webmonkey and pontificates about doing things the easy way at Simplicity Rules. He lives in Portland, Oregon with his girlfriend of four years and several dying plants. When it's not raining, he likes to play wiffle ball. 1. We'll get caught eventually. 2. It doesn't really work. Even in these days of virtual offices and affordable phone menuing systems, we can't look like anonymous big corporations forever. At some point, customers will realize that no matter whether they dial 1, 2, or 3 at the prompt, they're going to talk to the same person. So, why pretend otherwise in first place? Sometimes it's even unintentional. One of my projects is a site that lists free Portland WiFi. Part of any list upkeep is to make sure it is up to date. In my contact with coffee shops, I sometimes found them a little cold when I approached them as a company. It wasn't a lie--I do run a multi-talented Web development company. But almost all of my company's talents come from me and that's the full truth. When I say, "I'm just a guy who created a web site," I actually come across better to these folks who just happen to be a guy or gal that started a coffee shop.It boils down to people working with other people. Do you know why fish swim in schools? It's to look mean, right? When you or I pretend to be bigger, like the fish we end up looking scary. That's not what we want! We want customers to feel happy feelings. Big companies have no choice about whether to look big. Let them scare away customers.There's a lot of talk about small teams being better these days. Marketing guru Seth Godin has declared small is the new big. Embrace your smallness. Turn your team's product into Brand Us or your consultancy into Brand Me. Doing otherwise is futile. You can't get away with it and you might be covering up your team's greatest asset--being real people. Thanks Adam for this weeks great "Guest Blogger Friday" contribution.